The only photographs that we have from the Great National Assembly of Alba Iulia, which decided to unite Transylvania with Romania, are the ones taken by Samoilă Mârza. By chance, the only photographer of the historic event, he was 32 years old and had just returned from the front four days before the gathering. In order to reach Alba Iulia, Mârza went on a bicycle the whole 11 kilometres that separated his native village from the “Capital of the Union”. Born in 1886, in a family of Romanian peasants from the village of Galtiu, Samoilă Mârza made his apprenticeship as a photographer in Sibiu. At the beginning of the First World War, the young photographer was mobilized and sent to the front. For more than three years, he was in the Austro-Hungarian topographic and photographic service. When the war ended, he was stationed on the Italian front. From there, Mârza arrives in Vienna, where he photographed in a military barracks the sanctification of the first tricolour flag of the Romanian National Military Council. On November 20, 1918, the Romanian National Council decided to convoke the Great National Assembly “of the Romanian nation from Hungary and Transylvania, in Alba Iulia, the historic city of our nation, on Sunday, November 18 (December 1, new style)”. 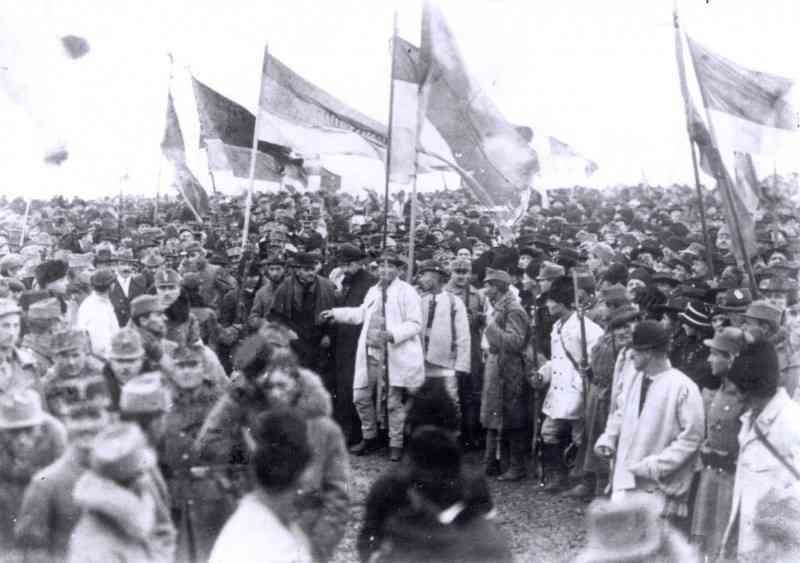 In addition to the 1.228 official delegates from all areas of Transylvania, invested with so-called credentials, a kind of empowerment that allowed them to participate directly in the debates in the Union Hall and to vote, there were over one hundred thousand Romanians that made the trip to Alba Iulia on December 1, 1918. Arriving home just four days before December 1, 1918, Mârza was one of these Romanians. On the morning of December 1, he put on his bicycle the bellows of his camera, the tripod, and the glass clichés, and joined the delegation of his village. Before leaving, he photographed the young people from his hometown, dressed in traditional garb. He arrived in Alba Iulia around 11 o’clock in the morning. The 32-year-old was unable to enter the Hall of the Union because he did not have a “credential”. The organizers of the Assembly hired a German photographer, Arthur Bach, who missed the event, so there is no photograph from the Hall of the Union where the debates between the delegates took place. The photographs made by Samoilă Mârza capture the large number of people who came to Alba Iulia on December 1, 1918, proving that the Union of Transylvania with Romania was a democratic act that enjoyed wide popular support. Citizens groups also carried banners with the name of their towns, which made it easier to identify the villages and cities from where the participants came from. In 1919, Samoilă Mârza made an album about December 1, 1918, called “The faces of the Great Assembly of Alba Iulia”, which he presented as a gift to personalities of that period, like King Ferdinand I, Prime Minister I.C. Brătianu, Nicolae Iorga, Iuliu Maniu or French general Henri Mathias Berthelot. A copy of this album was used as a document by the Romanian delegation at the Versailles Peace Conference. Even Nicolae Ceaușescu received a copy of this album in 1966 when he visited Alba Iulia. The photographer also managed to immortalize important historical events such as the visit of King Ferdinand I in 1919 in Alba Iulia, Abrud and Câmpeni, the crowning of King Ferdinand I and Queen Marie, on October 22, 1922, at Alba Iulia, or the events organized in Alba Iulia to mark the tenth anniversary of the Great Union, in 1928. Unfortunately, many of these images have been lost. Although his photographs have become famous in Romania and beyond, Samoilă Mârza has always lived on the edge of poverty, having to sell many of the glass clichés, with which he had immortalized the historical events he witnessed. These were destroyed, the glass being used in the manufacture of mirrors. Samoilă Mârza used for almost 60 years the same old camera, with which he photographed the Great National Assembly in Alba Iulia, on December 1, 1918. In 1967, he sold the camera and the photographs he made on that occasion to the National Museum of the Union in Alba Iulia. With the money he received from the museum, Mârza bought a new camera that he wanted to use in 1968, on the 50th anniversary of the Great Union, but he died in December 1967.